The parish complex of St. Patrick’s, Waukon, involves the church, cemetery, school, rectory and until 1995 a convent. The first Catholics in the vicinity of Waukon were of Irish ancestry, and the first priest to serve the area was Fr. Thomas Hore, who arrived at Lafeyette Landing,AllamakeeCountytogether with eighteen families fromWexford County,Ireland, in early 1851. Fr. Hore established the first Catholic Church inAllamakeeCountyin Wexford and also he served as an itinerant missionary throughout the county including, Waukon. Fr. Michael Kinsella was the first priest to live near Waukon. In 1855, with the financial aid of Patrick Norton and Thomas Farley, Fr. Kinsella purchased a forty acre plot which became known as “the Church Forty”. Norton, Farley and Richard Reddy cleared the land and built the first log church. Today “the Church Forty’ is Mount Olivet Cemetery. A succession of missionary priests served Waukon between 1857 and 1863: Fr. M.O;Farrell (1857-59); Fr. Walsh (1860-62); Fr. Nagle (1862) and Fr. Hannon (1862-1863). The first priest to reside in Waukon was Fr. Clement J. G. Lowrey (1863-66). He lived with James and Mary McDevitt where he celebrated Mass for the Catholic Community until 1864 when the site of the present church was purchased. The house located on that property became the church until a fire on March 9, 1868, destroyed the building, its contents and the parish records. Fr. Dennis O. D. Brennan arrived in 1868 and built an eighty by forty brick church with funds provided by Patrick Keenan and Mr. Liddy. Both donors were later reimbursed by the parish. In 1869, ill health forced Fr. Brennan to return toIreland. Next Fr. James B. McGowan became pastor (1869-74). Twice the brick church was enlarged to accommodate the expanding congregation. Fr. McGowan negotiated the purchase of a site opposite the church for a future school. The first of the longer serving pastors, Fr. John Hawe arrived in 1875-85. He added the bell tower and bell to the church. The enlarged brick church served until the arrival in 1912 of Fr. Michael K. Norton (1912-21). In 1906 Archbishop John Joseph Keane made St. Patrick’s Parish an irremovable rectorship. Fr. Norton purchased additional property, had the old church raised and erected the present Byzantine style Church in Spanish Renaissance archectural style. The corner stone was laid August 24, 1913. The church was blessed by Archbishop James John Keane on October 6, 1915. Fr. Norton served Archbishop Keane as a diocesan consultant and in 1921 was named a Domestic Prelate. Upon the death of Fr. Norton, Father John C. Stuart, President of Columbia College, nowLorasCollege, was appointed pastor of Waukon (1921-36). In 1932, Fr. Stuart was as named a Domestic Prelate in recognition of his disquinguished career in higher education. Fr. E. J. McDonald was formally installed a pastor of St. Patrick’s parish, August 30, 1936. he immediately began plans for a new elementary school and high school which was opened in 1939. In 1947, Fr. E. J. McDonald replaced the old parish rectory dating to Fr. Norton’s era (1912-21) with the present Indiana Ash Stone Rectory. In 1953, the Rev. John B. McDonald became pastor. In 1956, the 1939 grade and high school building was remodeled. In September 1961 a new grade school was opened to accommodate the expanding school enrollment and to proved new facilities for grades one through six. Grades seven and eight remained in the original, but remodeled, 1939 school. A new convent to house the Presentation Sisters was completed in 1965 during the pastorate of Fr. John B. McDonald. In May 1966, the earlier school-convent was raised to create a school playground. The convent was the last new parish structure. The convent was sold in 1995. Today it is operated privately as the Waukon Living Center. In July 9, 1991St.John the Baptist Parish, West Ridge, was closed. 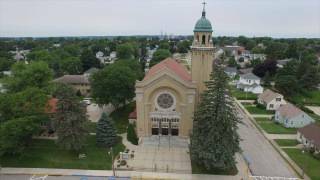 The territory within the boundaries of that parish was added to St. Patrick’s Parish in Waukon under the guidance of Msgr. Ed Lechtenberg. Fr. Joseph Schneider (2002-present) pastoral responsibilities were entrusted he was named pastor of St. Mary’s Parish,Hanover (2002) and St. Mary’s Parish, Dorchester (2002) In July 2006, St. Mary’s Parish, Lycurgus, was made an oratory. The much of the territory including the church and cemetery was added to St. Patrick’s Parish in Waukon. Michael Ward was ordained Permanent Deacon, October 20, 2007 and is assigned to St. Patrick Parish, St. Mary’s Parish,Hanover and St. Mary’s Parish, Dorchester. Fr. James B. McGowan (1869-75) negotiate with theWaukonIndependentSchool Districtin 1874 for the purchase of the land on which the original school and convent were eventually to stand. An old public school previously occupied the site. On January 5, 1875 the property was transferred to Bishop John Hennessy “in trust to the Catholic Church of Waukon.” The transfer was registered January 9, 1975. That same year, 1875, Fr. John Hawe (1875-85) arrived as pastor. Bishop Hennessy on his way home after the First Vatican Council (1871) visited Mooncoln,County Kilkenny,Ireland. He asked the Presentation Sisters to his Dubuque Diocese. He also recruited priests for his Dubuque Diocese. He secured both. The Presentation Sisters establishedMt.LorettainDubuque, in November 1874. Seminarian John Hawe also accepted the Bishop’s invitation. Bishop Hennessy ordained him January 1, 1873 and appointed him pastor in Waukon 1875. On September 1, 1883, Mother Presentation accompanied by Sisters Mary Alacoque, Ignatius, Stanislaus and Teresa arrived in Waukon to open St. Patrick’s School. Earlier in 1883, Fr. Hawe directed the construction of a four level brick building, for $5,000.00, which was to serve as both school and convent. In 1893 during the pastorate of Fr. Patrick A. Walsh (1885-1912) a south wing was added which doubled the size of the school. That original building served as school and convent until the new elementary and high school was open in 1939. The original building continued as convent and for music lessons until a new convent was built in 1965. The original school consisted of 10 grades until 1939. With the new facility, the high school was extended to 4 years, with the first graduating class in 1941. The high school achieved state wide recognition in both 1943 and 1944 when the St. Patrick’s Debate team won Iowa State Debate Championships both years. The first Catholic High School to do so. The high school program at St. Patrick’s was discontinued in 1970. Grades seven and eight were discontinued in 1971. Kindergarten was added in 1974. Msgr. William Roach (1979-84) hosted a Centennial Celebration of the Presentation Sister’s Ministry of education at St. Patrick’s Parish on September 11, 1983 with Archbishop James J. Byrnes, presiding. Presentation Sisters with the assistance of lay teachers continued to serve the parish and school until 2000. Sister Margaret Anne Kramer, PBVM. was Principal (1986-1992). Sister remained at St. Patrick’s Parish as Pastoral Associate until 2000. Lay Principals included Susan Lammers (1992-94); Peter Smith ( 1994-97); Michael Ward (1997-2002); Marcia Kruse (2002-2008); Dr. Richard Wede (2008-2012): and the present Principal Mrs. Katherine Fahey.